The trade routes of the Sultan of Muscat stretch from the land of the Zanj to the mysterious spice-islands. The land of Aceh (pronounced “atchay”), in northern Sumatra was one of these lands under Omani influence. Aceh was the first nation in South East Asia to convert to Islam, which was brought by the many Omani and Persian traders. In fact, the principle city of “Banda Aceh” was thought to be named for “Bandar Makka” or “Port to Mecca” in Persian, it was also nicknamed the “veranda of Mecca”. The isle of Sumatra and the Indonesian archipelago is home to many warriors and fearsome and beautiful weaponry. The warriors of Aceh, armed with intricate meteor-metal tipped spears and expertly crafted shields, are masters in light combat and the Malay martial art, Silat. 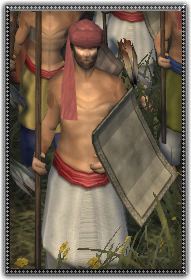 The spices are indeed sharp from this part of the isle, and these troops provide an exotic flavor to the armies of the Imam and are a testament to the power of the Sultan. Aggressive foreign natives poor in absorbing enemy cavalry but capable enough against enemy infantry.